Necklace of 90 cm around neck and pendant of 9 cm made with freshwater pearls of 5 mm in the grapes style part and 7 mm the three hanging pearls. The freshwater pearls are slightly less brilliant than their cousins the seawater pearls. However they offer a wider variety of colors and shapes. They are said to be more popular because they are more accessible in terms of purchase price. On the other hand being formed exclusively of mother-of-pearl they are more resistant to the use than their cousins of marine water nucleonné. Long earrings with freshwater pearls and Hematite heart. Long necklace of 85 cm around the neck of chips in Lapis-lazuli. 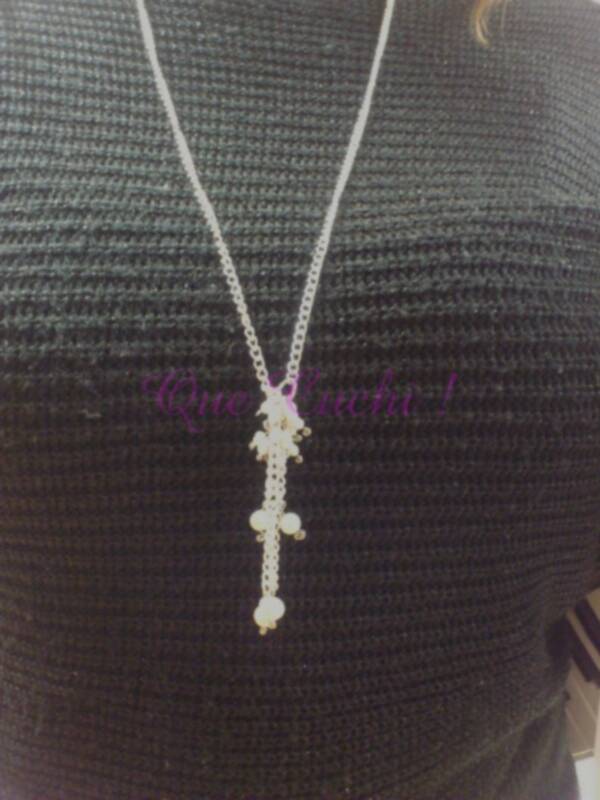 Long necklace of 85 cm with Sun of the stone chips.